WILMINGTON, Del. — PJM members were unable to reach consensus on any of five proposals to improve price formation for energy and reserves Thursday, leaving the Board of Managers to decide itself on what will be included in its planned FERC filing. A proposal by Calpine, which received a 73% support Wednesday in a vote by the Energy Price Formation Senior Task Force vote, garnered less than 42% support in a sector-weighted vote of the Markets and Reliability Committee on Thursday. Calpine’s proposal was a modification of PJM staff’s proposal, which won little more than 30% support Thursday. The top-ranked vote was for a proposal by the Independent Market Monitor, which won 52% support — still well below the 66.7% threshold needed for approval. Also failing was a compromise package by the D.C. Office of the People’s Counsel (less than 12%) and a proposal by Vistra Energy that largely borrowed from PJM’s proposal (44%). The votes followed about three and a half hours of debate and parliamentary maneuvering by members and was observed by O.H. 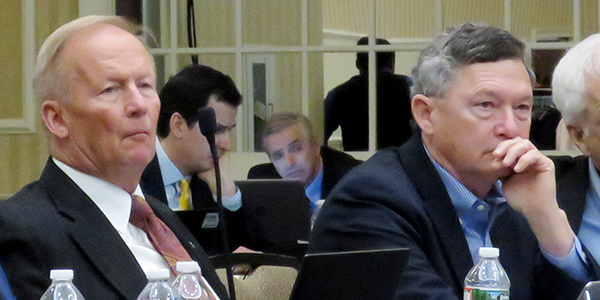 Dean Oskvig and Terry Blackwell, two members of PJM’s board, which had set a Jan. 31 date for stakeholder action. PJM CEO Andy Ott said after the MRC meeting that the board will decide on its path forward at its Feb. 12 meeting, based on input from Thursday’s debate and a Feb. 11 Liaison Committee meeting. Although none of the proposals won consensus at the MRC meeting, Calpine’s David “Scarp” Scarpignato still held out hope that an agreement could be reached before the board meeting. In a meeting later Thursday, the Members Committee agreed to hold a special conference call no later than Feb. 8 if additional discussions yield a potential compromise. A transitional mechanism to the capacity market’s energy and ancillary services (E&AS) revenue offset to reflect expected changes in revenues in the determination of the net cost of new entry (CONE). PJM’s proposal replaces the current stepped ORDC with a sloped curve; the first horizontal segment would represent the minimum reserve requirement, with the downward sloping curve based on the probability of reserves falling below the minimum reserve requirement (PBMRR) in real time based on uncertainties. The PJM proposal would increase the price for the initial horizontal segment of the curve to $2,000/MWh, up from the current $850. Calpine’s proposal was identical to PJM’s except that it excluded the transitional E&AS offset. The Calpine and PJM proposals won no votes from the End-Use Customer segment and only 3% of Electric Distributors. Ninety percent of Generation Owners supported the Calpine plan. In contrast, End-Use Customers and Electric Distributors unanimously supported the Monitor’s proposal, which won only 11% of Generation Owners’ votes. The Monitor’s proposal would replace the current two-step penalty factor ($850 and $300) with a single penalty factor equaling the safety net energy offer cap of $1,000/MWh. If PJM approves a cost-based offer above that price, the penalty factor could increase in $250/MWh increments to a maximum of $2,000/MWh. It also combines the Tier 1 and Tier 2 synchronized reserve products. Monitor Joe Bowring contends the IMM’s proposal addresses PJM’s concern over operators’ real-time actions suppressing prices better than the RTO’s proposal. He also says his plan would protect consumers from overpaying during the three-year transition period through a true-up mechanism for already-cleared capacity auctions and modify the capacity demand curve to ensure the efficiency of the energy offset. It does not include an ORDC for 30-minute reserves unless operators define a need for them. Unlike the PJM proposal, it does not limit the provision of reserves by demand-side resources. Bowring also has been critical of PJM’s proposal for a new five-minute uplift payment for buying back day-ahead reserve positions, saying it will inflate uplift payments. Moreover, he said, PJM is unable to accurately determine when units are following dispatch, raising questions about uplift calculations. Load interests expressed most support for the Monitor’s proposal. But Erik Heinle of the D.C. OPC also offered a proposal that he said was a compromise including elements from both the PJM and IMM plans. After the initial four proposals failed in their MRC votes, members also considered a proposal by Vistra Energy based on the PJM plan. It was similar to the Calpine proposal in not adjusting the E&AS offset. It also differed from the RTO’s proposal in limiting the top penalty factor to $1,000/MWh for all products except during hot or cold weather alerts, when the cap would be $2,000/MWh. It would have used a phased approach, with the penalty factor remaining at $850/MWh for the first two years following FERC approval, reflecting PJM’s three-year forward capacity auctions. In a Dec. 5 letter to members, PJM’s board said action was needed to minimize out-of-market payments resulting in uplift and ensure that energy and reserve prices accurately reflect RTO operator reliability actions during stressed conditions. But load interests are not convinced. In a letter to the board on Wednesday, the Organization of PJM States Inc. (OPSI) asked PJM to delay action until stakeholders have time to evaluate additional data. Under PJM’s “truncated voting” rules in the MRC, only the top-ranked proposal from the EPFSTF — Calpine’s — was guaranteed a vote. If it had received a two-thirds vote, the other three proposals would not have been considered. As a result, several members called for suspending the rules to allow votes on all four plans, saying it would provide more information to the board. Bruce Campbell of CPower said it was important that every proposal receive a vote at the MRC, noting that the task force votes weren’t sector weighted. Bob O’Connell, representing Panda Power Funds, unsuccessfully challenged a procedural ruling by Chair Suzanne Daugherty, contending that only the MC could suspend the rules. Members supported Daugherty’s interpretation, but in a second vote rejected suspending the rules. As it turned out, the point was moot: Because none of the four proposals won a supermajority, each of them was voted on in turn. Before the votes, Heinle made an unsuccessful motion to defer votes on any of the proposals and hold a special MRC meeting before Feb. 12. Several members reiterated their call for more simulation data on the potential impact of the rules, saying PJM had failed to provide enough modeling to ensure the new rules would not result in excessive costs. OPSI Executive Director Gregory Carmean asked whether PJM would produce simulations on the impact of “cascading” penalty factors for multiple reserve products. Susan Bruce, attorney for the PJM Industrial Customer Coalition, asked whether the RTO planned to simulate the impact of the new rules on the 2014 polar vortex. He said PJM could not replicate the polar vortex because it occurred before the current Capacity Performance rules. For example, he said, although the RTO had about 9,000 MW of demand response then, only about 3,000 MW of DR “showed up,” because, unlike under CP, it wasn’t required to deploy. Any simulation would show higher energy prices than were experienced in 2014, Keech acknowledged. Direct Energy, one of the largest retail suppliers in PJM, had opposed the RTO’s initiative but has since been convinced of the need to move revenues into the energy market, the company’s Marji Philips said. Although Direct is concerned about PJM’s proposed handling of DR, and it would like the RTO to share Tariff language with members before filing, Philips said it was “disingenuous” for stakeholders to request more data, calling it a delay tactic. “I’m hard on PJM, but they have been more than forthcoming with data,” she said. PJM’s last simulation, included in a paper published earlier this month, projected a net increase in energy and reserve market revenues of $1.92 billion annually, resulting from increasing annual energy revenues by $1.8 billion (increasing average LMPs by $2.27/MWh) and reserves by $190 million, while trimming $70 million in uplift (up to 42%). Including projected reductions in retail providers’ risk premiums, PJM said the most optimistic case — which assumes capacity resources reduce their offers by $30/MW-day — would result in annual cost savings to consumers of $350 million. Campbell said CPower, which aggregates DR resources, would not support any of the proposals and urged the board to start over. He said PJM’s deadline would result in an “incomplete market design” in which DR was an “afterthought,” as he said it was in the CP design. Because they are rarely deployed, DR resources obtain most of their revenues through the capacity market. “While increases to energy and AS revenues are expected to be offset by decreases to RPM [Reliability Pricing Model] costs, only in PJM’s most optimistic scenarios are the cost increases to load fully offset,” Campbell said. “Moreover, the RPM benefits to load are overstated because PJM has incorrectly assumed that all reduced capacity revenues will reduce revenues only to generators — thus ignoring the substantial portions of load that provide capacity via demand response and overstating the benefit of the changes to load. Bruce said PJM’s initiative must be viewed along with other rule changes pending before FERC on fast-start pricing (EL18-34) and expanding the generators that can include variable operations and maintenance costs in cost-based offers (EL19-8, ER19-210). “That adds up to about a 25% increase in LMPs,” she said. She criticized PJM’s “unduly conservative” ORDC, citing an analysis by the Monitor that suggested the RTO was overestimating outage risks. Scarp promoted Calpine’s proposal as a “compromise,” saying PJM’s $2,000/MWh maximum penalty factor is far below the value of lost load. He said Calpine could not support PJM’s capacity transition plan, saying the recently completed quadrennial review will reduce net CONE by 25% (ER19-105). Old Dominion Electric Cooperative and American Municipal Power backed the Monitor’s proposal. “We think the IMM’s proposal addresses the concerns of PJM and does so while preserving the equity of other stakeholders,” ODEC’s Mike Cocco said. After the four proposals that the task force reviewed failed to win a supermajority, GT Power Group’s Tom Hysinski moved for a vote on a proposal by Vistra Energy that would eliminate the E&AS offset (like Calpine) while using a $2,000 penalty factor during hot and cold weather alerts and $1,000 at other times. Monitor Bowring said the Vistra proposal had “all the negative aspects” of the PJM proposal and fails to address excessive payments to generators. It was backed by more than 80% of Generation Owners and Transmission Owners and about half of Other Suppliers, but it found little support with customer representatives and distributors. Although members agreed to continue talking, most appeared resigned that PJM will make a unilateral Section 206 filing with FERC. “If you’re looking for a [Section] 205 filing, it would [require] an ORDC that’s not so generous,” Bruce said.